While some children are spending the summer under the Oklahoma sun, others are indoors blazing through subjects that ordinarily pose huge challenges for them during the school year. Districts across the state are offering intensive summer school classes to help children catch up in core subjects like reading and math. 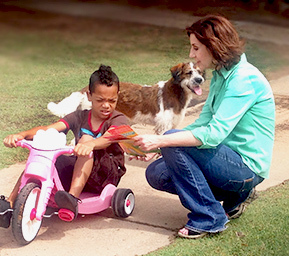 In Tulsa, each child in the program is given a customized summer-growth goal. These goals, in turn, have helped teachers approach learning with children’s individual strengths and weaknesses in mind. Chris Payne, spokesman for Tulsa Public Schools, says the approach is working, with 80 percent of children meeting or exceeding their summer growth goals. This progress is particularly important to struggling readers in third grade, who face possible retention if they score “Unsatisfactory” on the reading portion of the Oklahoma Core Curriculum Test. 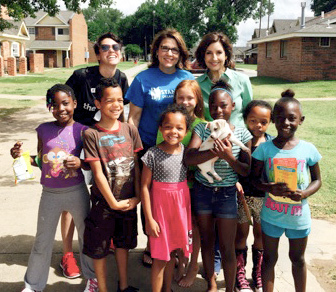 State Superintendent of Public Instruction Joy Hofmeister recently joined volunteers of an initiative to boost summer school attendance. On a humid Saturday morning, the group went door to door in west Tulsa to remind parents of the program’s importance. Payne said targeted efforts like mailings, phone calls and personal visits, stemming from a partnership with Stand for Children Oklahoma, are making the difference in getting Tulsa children to summer school. In Oklahoma City, reading is one of Anahi Morales’ favorite summertime activities. The soon-to-be fifth grader at Heronville Elementary is attending summer school to increase her vocabulary. The girl’s mother, Soccoro Morales, said it is difficult to help her daughter because Spanish is the dominant language at home. “When the kids ask, ‘What does that mean?’ I don’t know,” Morales said. Deivi Blanco-Santizo, bilingual communications coordinator at Oklahoma City Public Schools, said a major strategy to enhance reading skills in the district is to help English language learners build bigger vocabularies. Children may be able to read quickly but have little comprehension without the proper vocabulary. In Oklahoma City’s “summer universities,” class sizes are small, with only 12 to 15 children in a class, compared to an average of 20 to 25 during the school year. The program, which used to be only two weeks, runs June 10-July 9. During that time, teachers use games to engage learners. In addition to targeting specific skills, summer school also helps prevent the “summer slide,” the general learning loss that tends to occur when children aren’t in school. This setback can be devastating to the gains made by children during the regular school year. Students have demonstrated an easier time transitioning to the next grade by being engaged in the meaningful learning that is offered in summer school.